Describe the forces present in the two videos below. Identify, describe, and define ALL forces observed. Describe the issues the contestant are having due to the forces that are present. Also, what could you do to increase friction during the game. Any push or pull is a force. To describe a force, you must know two things. You must know the size of the force and the direction of the force. Suppose two teams are playing tug of war. Each team is pulling with equal force, but in opposite directions. Neither team can make the other team move. Forces that are equal in size but opposite in direction are called balanced forces. Balanced forces do not cause a change in motion. When balanced forces act on an object at rest, the object will not move. If you push against a wall, the wall pushes back with an equal but opposite force. Neither you nor the wall will move. Forces that cause a change in the motion of an object are unbalanced forces. Unbalanced forces are not equal and opposite. Suppose that one of the teams in tug of war pulls harder than the other team. The forces would no longer be equal. One team would be able to pull the other team in the direction of the larger force. More than one force can act on an object at the same time. If you hold a paper clip near a magnet, you, the magnet and gravity all exert forces on the paper clip. The combination of all the forces acting on an object is the net force. When more than one force is acting on an object, the net force determines the motion of the object. In this example, the paper clip is not moving, so the net force is zero. How do forces combine to form the net force? If the forces are in the same direction, they add together to form the net force. Suppose you and a friend are asked to move a piano for the music teacher. To do this, you pull on one end of the piano, and your friend pushes on the other end. Together, your forces add up to enough force to move the piano. This is because your forces are in the same direction. Because the forces are in the same direction, they can be added together to determine the net force. In this case, the net force is 45 N, which is plenty to move a piano - if it is on wheels, that is! If two forces are in opposite directions, then the net force is the difference between the two forces, and it is in the direction of the larger force. Consider two dogs playing tug of war with a short piece of rope. Each is exerting a force, but in opposite directions. Notice below that the dog on the left is pulling with a force of 10 N, and the dog on the right is pulling with a force of 12 N. Which dog do you think will win the tug of war? Because the forces are in opposite directions, the net force is determined by subtracting the smaller force from the larger one. In this case, the net force is 2 N in the direction of the dog on the right. Give that dog a dog biscuit! Unbalanced forces can change the motion of an object in two ways. When unbalanced forces act on an object at rest, the object will move. In the two examples mentioned earlier, the net force on the object is greater than zero. Unbalanced forces produced change in motion (acceleration) and the receivers of the forces - the piano and the rope - moved. Unbalanced forces are necessary to cause a nonmoving object to start moving. Second, when unbalanced forces act on a moving object, the velocity of the object will change. Remember that a change in velocity means a change in speed, direction or both speed and direction. For example, consider a soccer game. The soccer ball is already moving when it is passed from one player to another. When the ball reaches the second player, the player exerts an unbalanced force - a kick - on the ball. After the kick, the ball moves in a new direction and with a new speed. A kick on the ball creates a new direction and speed on the ball. Two forces are canceling out, so the door does not move. If you and your friend push on a door with the same force in opposite directions, the door does not move. Because you both exert forces of the same size in opposite directions of the door, the two forces cancel each other. 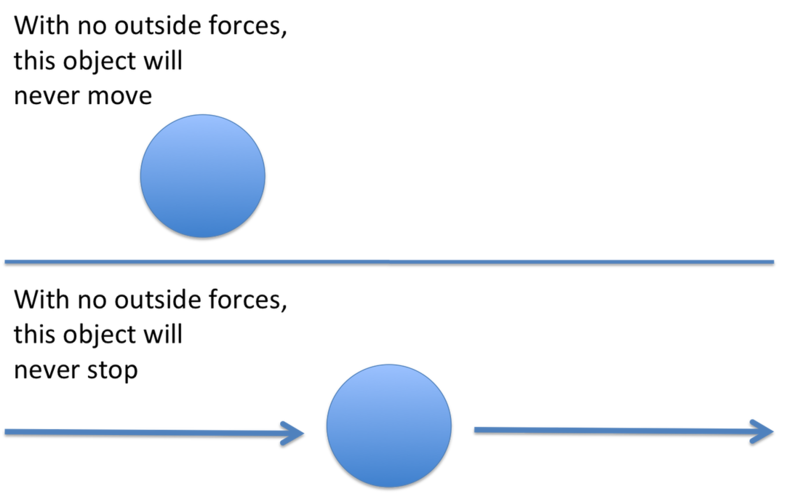 Two or more forces exerted on an object are balanced if their effects cancel each other, and they do not cause a change in the object's motion. If the forces on an object are balanced, the net force is zero. If the forces are unbalanced forces, the effects don't cancel each other. Any time the forces acting on an object are unbalanced, the net force is not zero, and the motion of the object changes. 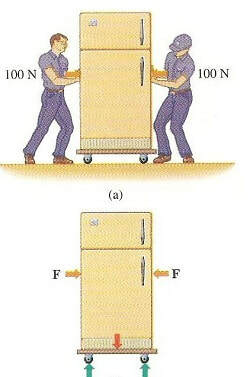 The figure below demonstrates that horizontal force acting on a refrigerator is F. If F is the only force acting on the refrigerator, then it will accelerate horizontally (a). The free-body diagram shows the net horizontal force acting on the refrigerator (b). This figure shows that when two people apply equal, oppositely directed forces to a refrigerator, these two forces cancel each other, and the net force equals zero. This means there cannot be any horizontal acceleration (a). If you stand on a skateboard and someone gives you a push, then you and your skateboard will start moving. You began to move when the force was applied. An object at rest - like you on your skateboard - remains at rest unless an unbalanced force acts on it and causes it to move. Because a force had to be applied to make you move when you and your skateboard were at rest, you might think that a force has to be applied continually to keep an object moving. Surprisingly, this is not the case. An object can be moving even if the net force acting on it is zero. A soccer ball, for example, receives an unbalanced force when it is kicked. However, the ball continues to roll along the ground long after the force of the kick has ended. Sometimes two or more forces can act on one mass at the same time. Such combinations of forces can balance each other. So forces do not always cause motion by pushing or pulling. If the forces are balanced, the object remains at rest. You can see an example of such balance in this figure. Buoyant and gravitational forces are shown opposing one another. The object in this case remains at rest. Friction is a force that acts in a direction opposite to motion. If there were not force of friction, a baseball player would never stop and would be continuously moving in the direction of motion. Balanced forces do not cause a nonmoving object to start moving. Furthermore, balanced forces will not cause a change in the motion of a moving object. Many objects around you have only balanced forces acting on them. For example, a light hanging from the ceiling does not move because the force of gravity pulling down on the light is balanced by an elastic force due to tension that pulls the light up. A bird's nest in a tree and a hat resting on your head are also examples of objects with only balanced forces acting on them. This figure shows another case where the forces on an object are balanced. Because all the forces are balanced, the house of cards does not move. Forces that are equal in size but opposite in direction are called balanced forces. Balanced forces do not cause a change in the motion of objects. Forces that cause a change in motion of objects are called unbalanced forces. Unbalanced forces can change the motion of an object in two ways. ​1. Balanced forces cannot change an object's _____. 2. Balanced forces are _____ in size but opposite in direction. 3. A _____ is a push or a pull. 4. Unbalanced forces cause moving objects to change their _____. 5. To describe a force, you must know its size and _____. ​25 N in the same direction. What is the net force applied on the car? Since you are pushing the car in the same direction, the forces will be added together. The airplane is moving with a force of 800 N. However, there are two forces moving in opposite directions on the airplane. The net force is 700 N.
The airplane will move with a force of 700 N as a result of air friction and wind. Problem #3: A brother is pulling a toy from his sister with a force of 6 N. The sister is pulling back with a force of 8 N.
What is the net force? The sister gets the toy of course since she is pulling with a stronger force. Friction is a contact force. Magnetism and gravity are noncontact forces. The law of universal gravitation states that all objects are attracted to each other by gravity. Friction can stop or slow down objects sliding past each other. An object's motion can only be changed by unbalanced forces. According to Newton's 1st Law, the motion of an object is not changed by balanced forces acting on it. Inertia is the tendency of an object to resist its change in motion. According to Newton's 2nd Law, an objects acceleration is the net force on the object divided by its mass. In circular motion, a centripetal force pulls an objects toward the center of the curve. Newton's 3rd Law states that when one object applies a force on another, the second object applied an equal force in the opposite direction on the first object. The forces of a force pair do not cancel because they are acting on different objects. 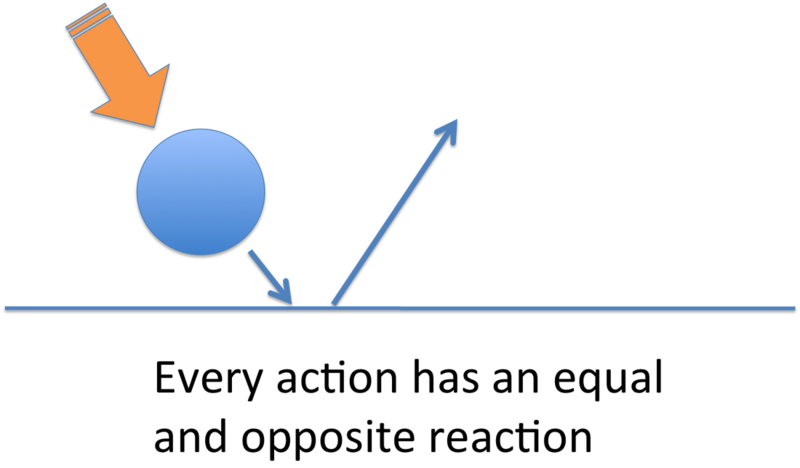 According to the law of conservation of momentum, momentum is conserved during a collision unless an outside force acts on the colliding objects. Objects store energy as a result of their position. Stored energy is referred to as potential energy. If you think about a bow, in its usual position without an arrow, the bow has no stored energy, thus it has no potential energy. When the bow is drawn, there is stored energy, as a result of its position. This is potential energy; it is stored in the drawn bow. Gravitational potential energy is the energy stored in an object as a result of its vertical position or height. The energy is stored as the result of the gravitational attraction between the Earth and the object. Kinetic energy is the energy of motion. When an object has motion, it has kinetic energy. Mechanical energy is the energy possessed by an object due to its motion or its stored energy of position. It can be either kinetic or potential energy. A force is defined as a push or pull. When you write, for example, you are exerting a force on your pencil because you push or pull it across the paper. Sometimes there are two forces acting together. If two people are pushing a table across the floor in the same direction, the two forces are added together. Adding these two forces together is called the net force. In the case of the two people pushing the table, the net force is unbalanced. When there is an unbalanced force there is a force that changes an object’s motion or causes it to accelerate. This can be shown with arrows; the wider arrow is the stronger of the forces. Two forces can also act in opposite directions. When the forces are equal and act in opposite directions, they balance each other out. There is no net force in this case. Using the example of two people pushing on a table, if there is a person on each of the opposite ends of the table and they are both pushing on the table with an equal amount of force, they balance each other out to a zero net force. This means the table will not accelerate. When there are separate forces that are not equal and one force is more powerful than the other, they will not balance out to zero net force. Because there is one force stronger than the other, the weaker force is not strong enough to balance the other end. They are pushing in opposite directions but one of them is pushing with a greater force. The motion will occur in the direction that the stronger force is moving. If two people are pushing on opposite ends of the table and one is pushing with more force, the table will accelerate in the direction that the person with the stronger force is moving. If there is a ball in front of you that is just sitting there, it will stay there until you kick it or until another force acts on it. Why is that? It is inertia. Inertia is the tendency of an object to resist any change in its motion, that means the object does not want to move or if it is moving, it wants to keep moving. Newton’s First Law of Motion is also called the Law of Inertia. This law states that an object at rest will remain at rest unless there is an unbalanced force acting on it. An object in motion will keep moving until there is an unbalanced forced acting on it. When two people are pushing the table in the same direction, it is easier to keep it moving once it starts to move than getting the table to move initially. This is because of inertia. 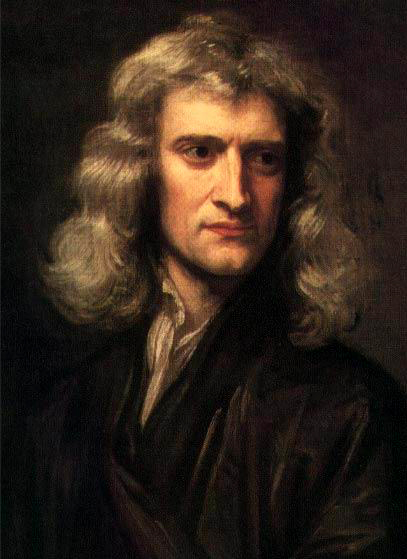 Newton’s Second Law of Motion explains how force, mass, and acceleration are related. The law states acceleration equals force divided by mass. When something accelerates it gains speed. When someone is driving and putting their foot on the gas pedal to gain speed, they are accelerating. If two people are pushing two tables, one a very heavy table and the other a very light table, the person pushing the light table will move it across the room faster than the one with the heavier table. That is because the lighter table has less mass. Students in fifth grade do not need to work with the formula, but they need to understand the concept of the relationship between force, mass, and acceleration. This law states that “for every action there is an equal but opposite reaction.” Whenever objects interact, they exert forces upon each other. This means that there is a pair of forces acting on the interacting objects. Forces always act in pairs, equal and opposite action-reaction force pairs. A bird uses its wings to fly by pushing the air down. The air reacts by pushing the bird up. The size of the force on the air equals the size of the force on the bird; the direction of the force on the air is opposite the direction of the force on the bird. This action and reaction pair makes birds fly. Some surfaces, like ice, are so slick it is easy to slip and fall. Others are so rough that it is difficult to slide things across them. All surfaces have irregularities that make up textures on the surface. Some textures you can see and others cannot be seen. Friction is caused by the irregularities getting caught on one another as two surfaces rub against each other. Friction acts as a force acting in the opposite direction of an object’s motion. Friction slows things down and can cause them to come to a stop. Friction helps us to move around as well. Without friction it would be difficult to move around on some surfaces. Friction can change its force based on the surfaces of the objects sliding together and how hard the surfaces are being pushed together. Besides slowing things down, friction also creates heat. If you rub your hands together they get warm because of friction. When you hold something up and let go, it falls because of gravity. Gravity is the force that pulls things towards Earth. The force of gravity acts between all objects. Gravity is an unbalanced force on a falling object, so when objects are dropping in a free fall, (with no other forces acting on the object), they will accelerate at a rate of 9.8 meters per second per second. So, in theory all objects would fall at the same rate. On Earth however, when something is dropped another force, air resistance is a force that acts upon the object as well. Air resistance is an opposite force acting on the falling object. Air resistance causes an object to fall slower. Air resistance is not the same on all objects because they have different surface areas. Objects with larger surface areas have more air resistance but that doesn’t necessarily mean they fall slower, the object’s weight also plays a factor. Weight is a measure of the force of gravity on an object. When a falling object’s air resistance equals the force of gravity upon that object, the object will still fall, but will stop accelerating. This is called terminal velocity. Some objects are easier to stop than other. Baseball catchers often catch a baseball that can be moving at very fast speed, or velocity, such as 80 or 90 miles per hour. Can they stop cars moving at the same speed? It is probably not something they want to try. The ball and the car have different masses. Even though moving at the same speed, it is not the same amount of momentum. The reason that these objects do not have the same momentum is because of their masses. The car has a much larger mass than the ball and has more momentum, making it more difficult to stop. Momentum is found by looking at the mass and velocity on a given object. Objects that have a small mass can also have a lot of momentum. Think of a bullet being fired from a gun. Because of its velocity being fired from that gun, it has a very large amount of momentum. Energy is defined as the ability to do work or cause change. Work is defined as the transfer of energy through motion, or force times distance. Calculation of work is not expected at fifth grade, but it is important to understand the concept with working with simple machines. Simple machines are tools that make work easier by allow us to push or pull over increased distances. The amount of work done depends on how much force is used and how far something is moved. Work is made easier by transferring a force from one place to another, changing the direction of the force, increasing the force, and increasing the distance over which a force is applied. When a machine puts out more force than is put in, the machine is said to have a mechanical advantage. Simple machines cannot increase both the strength of the force and the distance it moves at the same time. A simple machine can produce more work than the amount of work that is put into the machine. 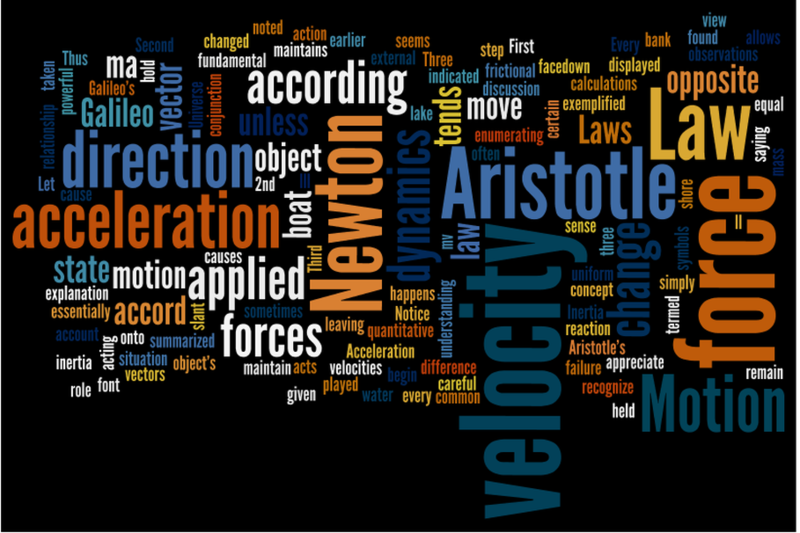 Here's the webquest in case you miss 2 or 3 days of Newton's Laws (great for review!) - The worksheet is here. This virtual experiment is a lot of fun - but watch the 2 slideshows first! One sinker in the canister - car moved 26cm. With 4 sinkers in the canister - car moved 63cm. This goes with the handout. Check out how different forces applied to shopping carts of various masses changes the acceleration. Thanks to Ms. Knowlten's class for this link! Want to get the basics in a quick and easy format? This is the place! Read the introduction and select 3 of the following modules to complete: roller coasters, bumper cars, carousels, pendulums, ride safety, or free fall. Complete one of the 10 assessment options to demonsrate your learning. Pretty good for a bunch of 7th graders! Fun! Great way to get closer to Newton's 2nd Law while at the same time reviewing some mass and weight concepts! Really easy to do. A short song about the formula of Newton's 2nd Law. Try this game after you review the slideshow (link above). Short animated slideshow about force, mass, and acceleration in zero gravity. Try this, then try the 2nd Law experiment (next link). In zero gravity it's easy to see how action and reaction works. Try this short animated slideshow to learn more, then try the experiment(link below). This experiment lets you be the astronaut, and helps you understand action/reaction, and just how force, mass, and acceleration are related. This page has lots of animated slideshows and virtual experiments created by the European Space Agency. Baseball and Newton's Laws? Yep!